Collins, Ross and Washburn, Patrick. 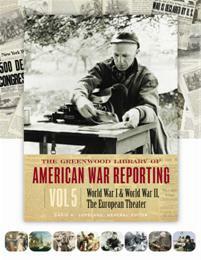 The Greenwood Library of American War Reporting: Volume 5, World War I & amp;World War II, The European Theater. Greenwood, 2005. ABC-CLIO, publisher.abc-clio.com/9780313395406.